American University’s Kogod School of Business is one of the leading business schools in Washington, D.C. The School is accredited by The Association to Advance Collegiate Schools of Business, representing the highest standard of achievement for a business school worldwide. Dedicated to providing an interdisciplinary business education, Kogod offers market-driven undergraduate and graduate degree programs. Kogod’s diverse faculty are distinguished scholars and accomplished professionals with both research and real-world experience. Our global network of alumni and students recognize that purpose and profit are not at odds and are driven to make a difference within organizations and the world at large. The Kogod Admissions Office requires the following from all applicants: a completed online application form; a personal statement of purpose in pursuing the MBA; a current resume; two letters of recommendation; an official transcript from all attended undergraduate and graduate institutions; and an official GMAT score report. International applican...The Kogod Admissions Office requires the following from all applicants: a completed online application form; a personal statement of purpose in pursuing the MBA; a current resume; two letters of recommendation; an official transcript from all attended undergraduate and graduate institutions; and an official GMAT score report. International applicants whose first language is not English must also submit an official score report for other the TOEFL or the IELTS. An interview is required of all applicants. The atmosphere in the Kogod MBA program “is low key, friendly, and accessible,” with “a great learning environment. The students are all very friendly and socialize together regularly. The professors are very approachable and friendly, and have some impressive resumes. The academics are tough and the program is effective but not cut-throat.” Kogod offers “many clubs and organizations in different fields,” and students report that “involvement is highly encouraged.” Some here feel that “the program is not as social as others, and this is due in large part to the fact that the school is located in a relatively upscale neighborhood, and there are few restaurants or bars in the immediate area. Also, students tend to live all over Washington, D.C.,” so “Getting large groups together can be difficult. However K-LAB provides co­curricular programs for grad students and students at Kogod are very involved with intramural sports. Further, most agree that “D.C. is one of the most exciting and fun cities in the country.” As an added bonus, “There is so much work in D.C. that making $100K a year is almost automatic if you connect with the right government-related job.” Students here represent a variety of backgrounds. “I come from a military background,” says one MBA, “and I really enjoy mingling and working with people from nonprofits, other government agencies, small companies, and large companies.” The population includes a substantial international contingent. Career Services at Kogod “does a great job in involving alumni in school life. There are lots of networking opportunities . . . [and] lots of on-site visits with direct interactions with alumni, both young and more experienced.” A Wall Street trip includes visits to “all the major financial institutions with alumni as tour guides and a session for Q & A’s and recruiting procedures and tips, concluded by an alumni networking dinner.” Career Services Counselors also provide “constant information about new jobs/internship opportunities in the D.C. area and beyond.”Companies that have recently hired Kogod MBAs include: Accenture, Baker Tilly, Booz Allen Hamilton, Corporate Executive Board, CSC, Defense Logistics Agency, Deloitte Consulting, Discovery Communications, Ernst & Young, Fannie Mae, Hilton Hotels Corporation, IBM, Infastructure Management Group, Intelsat, National Geographic Society, PricewaterhouseCoopers, Raytheon, Sunstar Strategic, Wells Fargo and The World Bank. The American University Kogod School of Business is one of the leading business schools in Washington, D.C., and is the school of choice for students who want to obtain the critical thinking and problem solving skills that will enhance their ability to lead in a rapidly changing global business environment. The Kogod School of Business offers business degrees with an unmatched opportunity to integrate a business education with real-world experiences and a global perspective. The Kogod School of Business dual degrees, strong co-curricular programs, endowed scholarships, thought-leading research and comprehensive center for career development attract high quality students and faculty from around the world. 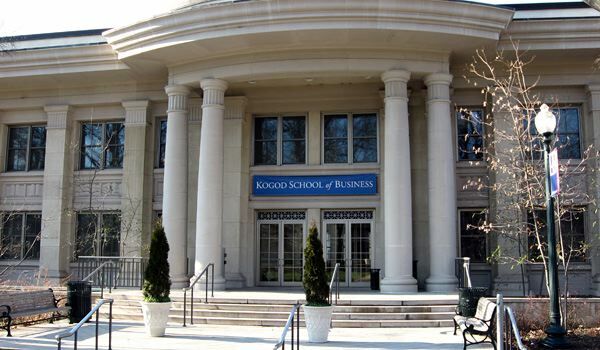 The “small and friendly” MBA program at American University’s Kogod School of Business offers a “solid academic program” that, like its namesake (Robert P. Kogod, Charles E. Smith Co.), excels in the area of real estate. American’s Washington, D.C. loca­tion is ideally situated for a curricular focus on international matters, and the school exploits that opportunity well, interjecting “an international perspective in class discus­sions that is second to none. Almost all classes integrate an international component.”Kogod’s strengths extend far beyond real estate and international business, however. The school boasts a finance faculty that is “internationally recognized for their research. They are great instructors too.” Students praise the commercial banking concentration offered here and love the fact that the program “allows you to concentrate in two areas of expert­ise,” which “lets you design your own MBA” and “is a great advantage in the job mar­ket.” Kogod offers a diverse set of electives for their students to supplement their majors and some students even choose to design their own majors. Kogod recently “created the first LLM/MBA in the country, which is an excellent way to combine international law studies and business.”Kogod’s pedagogical approach embraces a mixture of case studies and theory, combined with plenty of group work that acts as good practice for the real world. Professors “have a great reputation and have done interesting research.” They are also easy to contact because of an “open-door policy.” Faculty members “bring a lot of academic and profes­sional experience” to the program—another plus. “We have former investment bankers, former consultants, former CFOs, and lifelong academics,” brags one student. Small class sizes “give Kogod an advantage over the other D.C. schools like Georgetown and GW. I know everyone by name, and that’s a nice feeling.” As a result, the program “feels like being in a big family. Everyone knows you and does their best to help you.” Kogod’s D.C. address “creates many opportunities for networking, internships, etc.” As one student puts it, “The D.C. location gives Kogod a huge advantage. There are so many more opportunities to pursue when you are in a big city. It also helps Kogod draw “inter­national students from very diverse countries,” enhancing in-class and networking expe­riences. Perhaps best of all, this is a school that “is in the middle of overhauling its cur­riculum.” In addition, the school recently completed a 21,000 square foot expansion which opened in 2009. The expansion which included 7 new class rooms, 3 student lounges, a financial services and information technology lab, a career center suite, a behavioral research lab, a mini-computer lab, and several breakout rooms. With these changes, one MBA predicts that “I think there will be some great changes” in the school’s near future. Kogod offers two distinct MBA program formats to meet our students' unique personal and professional needs. Students may choose the immersive, full-time program, or select the part-time program, designed for professionals who wish to continue working while pursuing an MBA.The Full-Time MBA The Kogod full-time MBA is designed to be a career catalyst for ambitious professionals. In 21 months, graduates acquire the knowledge, skills, and experience required to achieve professional success. Students complete the core in the first year, leaving the second year open to electives. Students gain knowledge and skills in both domestic and global business through experience and interaction with clients, professors, business leaders, and fellow students, both inside and outside of the classroom. Students may pursue a specialized consulting focus, developed with leading federal and commercial consulting firms, to prepare for consulting in human capital, finance, IT or strategy. Alternatively, students may choose to investigate electives with an emphasis on accounting, entrepreneurship, sustainability management, or other business disciplines. Internships, career development, and volunteer opportunities will ensure students graduate with a deep network of contacts from the American University community and beyond. Core Curriculum: Applied Managerial Statistics, Applied Production and Operations Management, Financial Accounting, Financial Management, Management Information Systems, Marketing Management, Organizational Behavior and Human Resources, Leadership and Skills Workshops, Signature Course 1: Business at the Private-Public Sector, and Signature Course 2: Manager in the International Economy. The Professional MBA Kogod's Professional MBA (PMBA) is designed for working professionals seeking to advance their careers. The PMBA's comprehensive cohort-based design and contemporary delivery allows students to continue working and complete their degree in 27 consecutive months. Offered in two unique cohort options, students either attend class one morning or one evening per week. The program's concierge-style services and hybrid teaching approach help students achieve a positive work-life balance. Course materials, an iPad, light meals during class time, course registration, and an international travel-study experience are all included in the tuition. The focused schedule-one course at a time- allows students to absorb and retain material better, and the format provides opportunities to work and collaborate with peers in a digital environment. Courses include: Strategic Thinking, Accounting, Negotiations, Statistics, Operations Management, Economics, Organizational Behavior, Business Law, Finance, Marketing, Leading Team, Management Information Systems, International Business, Study Aboard, Project Management and Ethics. International Business Student Association (IBSA) IBSA brings together scholars and professionals to exchange information and ideas in a multinational and multicultural environment. The association provides leadership in the areas of international business and economic research and practice. It sponsors forums, encourages research collaboration, and supports educational activities of the highest professional quality. Hispanic MBA This organization promotes Hispanic students within the business community and seeks to foster Hispanic leadership within the Kogod community through professional development activities. Club members participate in conferences, networking events and fundraising. Black MBA Association A chapter of the National Black MBA Association, the Black MBA is dedicated to creating profitable partnerships that create and enhance intellectual and economic wealth in the Black community. This organization gains its strength from a strong belief in community and a commitment to its development through economic and educational development initiatives that support the global African American community. Asian MBA Association This professional club has a vision to provide service, representation, and advocacy for Asian MBA students at the Kogod School of Business. This club holds networking events, speakers and fundraisers to further its mission. Kogod's Office of Business Communication offers writing and speaking coaching to all students. Kogod Women in Business (KWIB) This chapter is a member of the National Association of Women MBAs and seeks to promote the education and advancement of women in business by providing support through networking and mentoring opportunities, developing resources and abilities to be successful, and raising awareness through community outreach. Want more info about American University, Kogod School of Business Full Time MBA? Get free advice from education experts and Noodle community members. What are some key features of the full-time MBA program at American University’s Kogod School of Business?